386 – External Imbalances in the European Union and International Fragmentation of Production: Is There a Link? 374 – Can Intellectual Property Rights Protection Generate Brain Gain from International Migration? 373 – Value Added Exports and U.S. Local Labor Markets:Does China Really Matter? published in 2018 in the Industrial and Labor Relations Review, vol. 71(4), pp. 853-881.
published in 2015 in Bakens, Jaques and Peter (ed.) The Economics of Cultural Diversity, Edward Elgar. 363 – Does the Risk of Poverty Reduce Happiness? Nov 2013 Press Reviews: The Economist, The Guardian, BBC News, Financial Times, Independent, Sky news, The Times, La Stampa. Nov 2014 Press Reviews: The Guardian 1, The Guardian 2, Telegraph, The Times, Independent, Daily Mail, Financial Times 1, Financial Times 2, The Economist, Il Sole 24 Ore.
Click to see the complete international media coverage. 344 – Demand or Productivity: What Determines Firm Growth? 339 – Does International Migration Increase Child Labor? 333 – Exports and Wages: Rent Sharing, Workforce Composition or Returns to Skills? 332 – Were Multinational Banks Taking Excessive Risks Before the Recent Financial Crisis? 325 – What Drives Individual Attitudes towards Immigration in South Africa? 306 – Are Exporters More Likely to Introduce Product Innovations? 283 – SMEs in Argentina: Who are the Exporters? 264 – The Costums Unions Issue: Why do we observe so few of them? 263 – Global Manufacturing SO2 Emissionss: Does Trade Matter? 257 – Can Offshoring Reduce Unemployment? 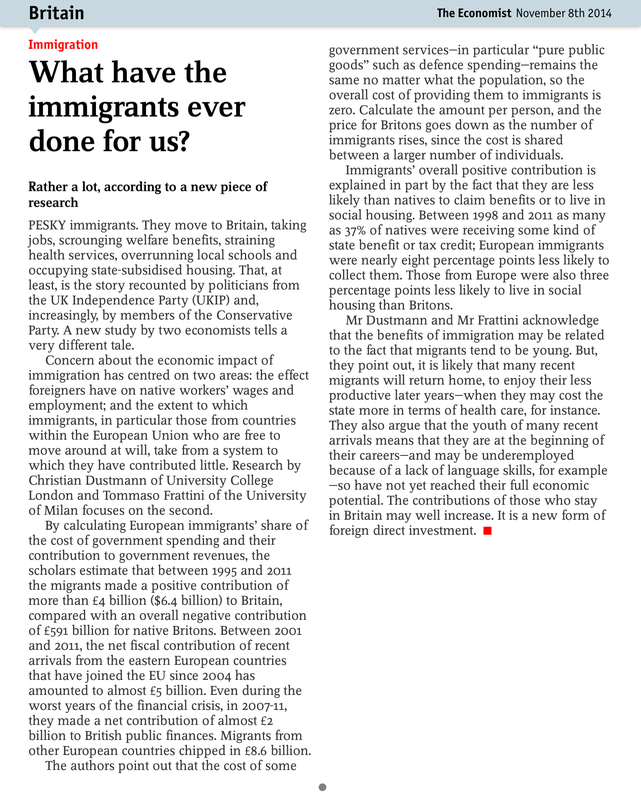 256 – Do Interest Groups Affects US Immigration Policy? 254 – Do Countries Free Ride on MFN? 240 – Who is Against a Common Market? 221 – The World Bank’s Early Reflection on Development: a Development Institution or a Bank? 203 – How Do Trade in Intermediates and Geographical Forces Interact in Determining the Localisation of Industries in Central Eastern European Countries? 200 – Attracting Foreign Direct Investments in Europe: are Italian Regions Doomed? 191 – Who runs the IFIs? 189 – What does motivate lending and aid to the HIPCs? 173 – The Brain Drain: an Unmitigated Blessing? 172 – Trade Liberalization, Firm Performance and Labour Market Outcomes in the Developing World: What Can We Learn from Micro-LevelData? 166 – Foreign Ownership and Productivity: is the Direction of Causality so Obvious? 162 – Wage Premia and Skill Upgrading in Italy: Why Didn´t the Hound Bark? 158 – Divergence-Is it Geography? 130 – Multinational Corporations, Wages and Employment: Do Adjustment Costs Matter? 106 – Were Trade and Factor Mobility Substitutes in History?